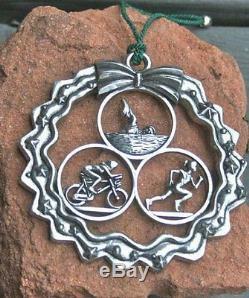 Triathlon Ornament in Wreath - Female. Stars, ornament balls, and a bow atop a festive holiday wreath encircle a triathlete - run, bike, swim - in this gorgeous design by Dana Paige, cyclist and artist. This beautifully hand-crafted pewter Triathlete in Wreath Bicycle Ornament will make an elegant addition to your holiday tree or a great gift for your favorite cyclist! Our pewter ornaments can be hung from a tree, mantel or anywhere else your imagination sees fit! Pewter ornaments are individually boxed using recycled material. Hand-crafted in the USA of the finest pewter. Actual size of pewter ornament is 3" W x 3" high. Pewter ornaments are individually boxed using recycled materials. Green Braided Cord for hanging, Shiny Finish. Your return must be in new and unused condition. After this time period, we cannot accept a damaged return. Damaged items will only be exchanged once we receive the damaged item back. Please include your return reason in detail. The item "Triathlon Ornament in Wreath Female, New" is in sale since Tuesday, January 31, 2017. This item is in the category "Home & Garden\Holiday & Seasonal Décor\Christmas & Winter\Ornaments". The seller is "yozos" and is located in Crosby, Texas.